The Vampire Diaries remains The CW’s #1 show with young female demos. Fans can get sucked into all 22 one-hour episodes from season six and gorge on nearly two hours of gripping extras — including two brand-new featurettes, episodic audio commentary, the 2014 Comic-Con panel, deleted scenes and a gag reel. The Vampire Diaries: The Complete Sixth Season will be available on Blu-ray™ and DVD on September 1, 2015 thanks to Warner Bros. Home Entertainment release. Season Six is also available to purchase on Digital HD. 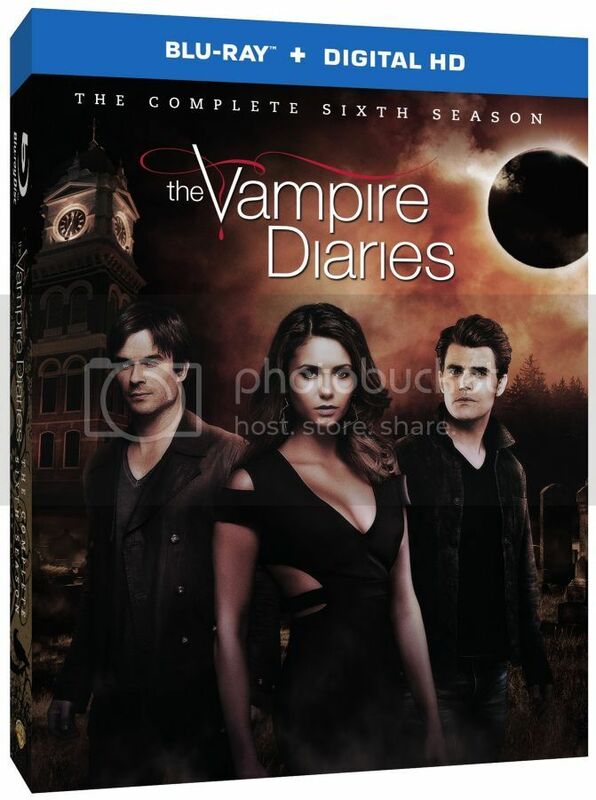 With Blu-ray’s unsurpassed picture and sound, The Vampire Diaries: The Complete Sixth Season Blu-ray release will include 1080p Full HD Video with DTS-HD Master Audio for English 5.1. The 4-disc Blu-ray will feature a Hi-definition Blu-ray, and a Digital HD copy of all 22 episodes from Season Six. Good news, The Vampire Diaries will return for a seventh season on The CW this fall. We are very excited about this release and happy to give a chance to win a copy of The Vampire Diaries: The Complete Sixth Season to one of our US readers. Simply fill the Form below and Good Luck! The giveaway ends September 14, 2015 and open to US residents only (no P.O. Boxes, please). I'd love to win because I didn't see this last season yet. I would like to win this for my brother and I to watch together, he is able to watch it where he lives, but I do not get that channel here where I live. I would love to win, because it's a great show! Thanks for having the giveaway, and for the chance! My sister loves this show and I would love to win for her. It'll go great with the other seasons in my collection. My daughter watches the Vampire Diaries. We collect the seasons for her. This is the only season we are missing. I would love to give this to my DIL. She would be so happy. I'd love to win because I'm a huge fan of vampire diaries. I've been watching it since the very first season. I would love to win this DVD set because I have not watched this season yet. Thanks for the chance to win. I'd love to win because I like the show and haven't seen all the episodes. This is my daughter very favorite show so I would love to watch it with her. I would love to win the DVD because The Vampire Diaries is one of my favorite shows. My kids love the stories and show. Vampires are very popular along with all things to do with the occult. My daughter has always loved Vampire Diaries. we could watch this together. This would be fun to watch in my down time. I got hooked on this show from the first year. I would love to have this. I would love to win a copy of The Vampire Diaries: The Complete Sixth Season because both my Dad & I love this show. I could watch all the episodes then he could borrow it from me. I love all the different supernatural beings this show has! one of my most favorite series and I have yet to own it :) I would love to cuddle up and watch it after the kids are in bed. I would love to win this so that I can watch it with my niece. This is an awesome series.